A Parade of TOP TUNES! Abbott and Costello turn the U.S. Army upside down in this hilarious World War II comedy. They portray two dim-witted tie salesmen who accidentally enlist in the army to avoid getting arrested. But they find now relief since they are now being ordered around by the Sargent (Nat Pendleton) who used to be the policemen who chased them.While Bud and Lou go through many of their now classic routines, they meet President Roosevelt himself, as well as The Andrew Sisters, who get the troops moving with hits like Boogie Woogie Bugle Boy. 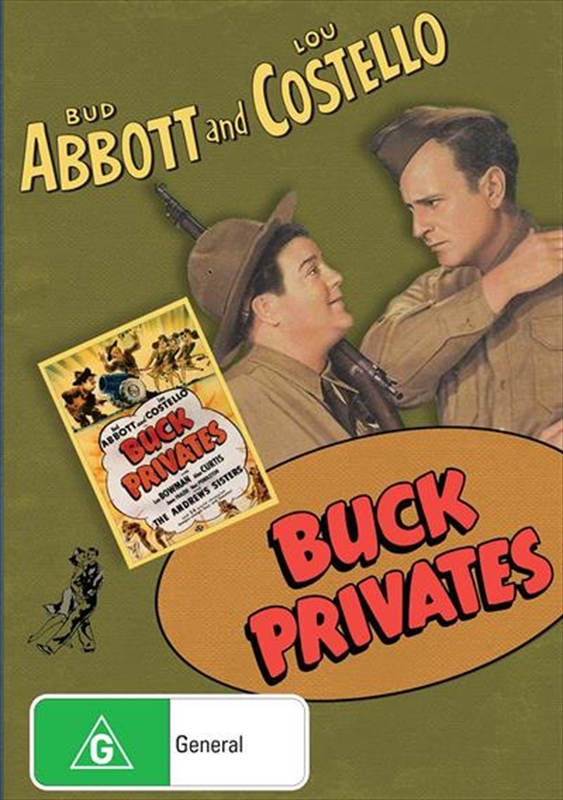 Made on a shoestring budget,Buck Privates became a box office smash, securing Abbott and Costello's spot as Americas leading comedy team.